It doesn’t matter if you work in utilities, in construction, or on the farm; if it’s cold outside, you need a face mask. The vast majority of standard cold-weather work wear provides protection for everything but the face, so it can often take the brunt during intense wind, snow, sleet and rain. If you spend any portion of your workday outside during the winter, it’s a good idea to wear a face mask to keep out the cold. 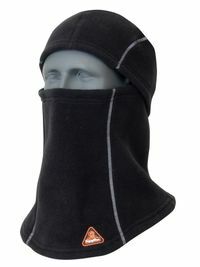 Whatever your climate or working conditions, RefrigiWear has the perfect mask for you. From balaclavas to 3-hole masks, our face masks are made with cold-busting materials—including Polartec fleece, Neofleece and ultra-protective laminated fabric. Some have upgraded features like moisture-wicking linings and mouthpieces with breathing holes. In other words, there are few other masks that can handle your day quite like ours. We’ve also got versatile options, like our PolarForce Balaclava Mask that can be worn as a full balaclava, a gaiter or an open-faced mask, depending on your specific needs at the moment. No matter which kind of RefrigiWear mask you choose, you can be sure it will help you face whatever the day throws at you. Here are some of the main reasons why you should never leave for work without your trusty winter mask. They Prevent Cold Stressface is more sensitive to temperature changes than the rest of the body, having a cold face makes us perceive that we’re colder than we are. They Protect Your Skin – It’s probably the last thing on your mind when you’re trudging through a busy workday, but your skin deserves protection just like the rest of you. The truth is that extreme temperatures can take a serious toll on the face, causing severe dryness, sores and We all know the uncomfortable feeling of wind whipping against the face, and nothing will distract you faster when you’re trying to focus on the job in front of you. They Keep You Compliant – Although the ­Occupational Safety and Health Administration (OSHA) doesn’t set forth specific standards for most workwear in cold environments, they do specifically recommend wearing a knit mask to cover the face and mouth. OSHA also recommends at least three layers of loose-fitting clothing (tight clothing can reduce blood circulation, which is vital in cold weather), plus a hat, gloves and insulated, waterproof boots. You’re not going to be penalized for not following these standards, but it’s still good practice to follow OSHA regulations while on the job. They Keep You Hydrated – It seems strange, but did you know that wearing face masks can help keep your airways moist? When you’re constantly exposed to dry, cold air, it can trigger dryness in your mouth, nose and throat, which leads to coughing and pain. If you’ve noticed these symptoms when you’re working outside, make sure to select a mask that covers the mouth and nose, such as our Performance Balaclava that helps fight dryness. Don’t worry – it still offers easy breathing, thanks to the mouthpiece with breathing holes. When the weather is quite literally in your face, you’ve got to make sure you’re protected from head to toe. RefrigiWear specializes in offering warm work gear for everyone who must brave the cold day in and day out. With some of the most impressive warm work jackets, gloves, coats, hats, footwear and more, we keep you warm while also helping you focus on the job in front of you. Trust RefrigiWear for all of your cold-weather fundamentals.